With their latest offering, Counting To Zero, (their seventh full-length studio release), Collide return to their well-established form. Having carved out a prominent niche for themselves within the darkwave and electronica genres, this album will once again be independently self-released on the band’s own label Noiseplus Music. With an expansive career in music, (which includes their side project called The Secret Meeting with Dean Garcia of Curve), Statik has also contributed to projects by other artists as wide-ranging as Tool, Prince, and Leonard Cohen, to name only a few. 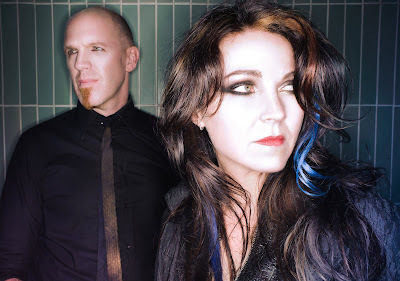 Collide’s songs have been remixed by well-known producers Charlie Clouser (NIN, Saw), cEvin Key (Skinny Puppy), and Rhys Fulber, (Frontline Assembly, Delerium). The duo has been featured internationally in many magazines including: Outburn, Nocturnal, Gothic Beauty, The Mick, Beyond Fantasy, Keyboard, Side Line, Zillo, and Glasswerk, among others. kaRIN has also been making waves in the fashion industry as well, with her Saints & Sinners jewelry and accessory line. Collide’s atmospheric soundscapes have been featured on the uber-popular True Blood (HBO), Vampire Diaries (CW), Fringe (Fox), and NCIS (CBS), as well as being featured prominently in feature films such as Resident Evil (Sony), and The Covenant (Sony). Collide are set to impact the scene once again with “Mind Games,” the leading single of their highly anticipated brand new album, Counting to Zero. The album features eleven new and original tracks that channel the band’s electro, darkwave, trip hop, and synthpop core, with a subtle dose of exoticness. “Mind Games” is set on digitizing your brain matter into a cybernetic dreamscape of bass, beats, guitars, and synthetic ear candy supplemented by kaRIN’s ethereal female vocals. The video is set in the Californian desert, adding to the ambiance of desolate feeling of falling victim to your mind. This clip is filled with visual tricks to boot as kaRIN and Statik mirror and multiply within the frames of their performance. Each cut is a visual compliment to the audio weirdness of the song. The only question is – are you ready to take the journey?